Learn with Lee: Real Estate Coaching and Consulting: LEARN WITH LEE LESSONS: Should I Use a Single Property Website? LEARN WITH LEE LESSONS: Should I Use a Single Property Website? Question: Do I need to have a landing page for each property I list (a.k.a. a single property website) to enhance its marketing? Learn with Lee Lessons: Before you put on your real estate thinking cap, put on your consumer hat. Do you like one-stop shops or do you want every product to have its own standalone space? Based on the popularity of Amazon, Target, and Sephora and the breadth of variation of items purchased in a single transaction, I dare say most of us like to be able to go to one place or website for varied products. Now put your real estate marketing cap back on. Single Property Websites are a web 1.0 relic. That is not to say there is not some value to them because they can be quite effective in marketing a solo real estate property for sale. Essentially, "old school" may work but you may miss out on today's progressive strides that help you to work smarter instead of harder. 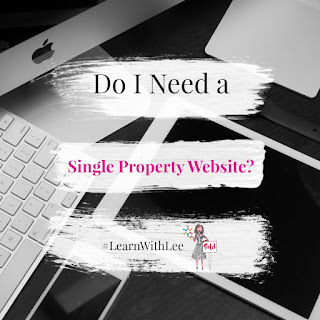 Single Property Websites typically do not capture long-term attention and usability, which is vital to ensure that you do not recreate the marketing "wheel" EVERY time you have a new listing to promote. Today, you want to do things that build your online, positive history and work well to layer upon your online marketing efforts. The best practices of today's marketing gurus encourage us to build our "Google juice" (what techies call search engine optimization that helps your brand to rank higher among search engines). Thus, having a website page that is only live for a few weeks while the real estate property is being marketed means you are not thinking long-term about your brand. Some may say that thinking long-term about your business growth is a conflict of interest to selling a home. Not true! The more you can build your online notoriety and credibility, the more likely your listings will gain better exposure because of your higher "Google juice", making this a win for your home seller clients. For example, have you ever gone to a website that no longer existed - I am sure it turned you off to whoever and whatever was being sold. That is what happens when you do urls like www.123Main.com. At some point, you won't pay for it and it goes dead. Yet, as you know, people will search online for things months and years later and that broken, defunct website link just may pop up for eager home buyers (i.e. your seller's prospective client). They expectantly click the link to only be disappointed by a blank screen. Next!, is what I am sure they will distastefully exclaim as they cross your services off their online shopping list. If you must go standalone (typically because you want people to separate your brand from your product for the lure), you would do better to have a page, post or site that focuses on a community, subdivision, or complex that you can update with your listings but the url link always works. Communities and the complexes and subdivisions within them resonate more anyway with people than a single address. For instance, instead of www.123Main.com for a home listed in the make-believe Picket Fences community, your url link could be www.PicketFencesHomes.com. Now, you can specialize in that neighborhood, update the pages content to reflect what is current and share a url link that never gets old and useless. Maybe someone is scrolling through your social media feed from months ago and sees the "perfect" home. If they clicked on www.123Main.com they would get zip, zero, zitch, nada and you would likely lose a potential lead. However, if you have www.PicketFencesHomes.com, now the potential home buyer gets your actual, live, working site and can see what is current. Boom! Better yet, I encourage you to use your own site as your online anchor and make it the authority for the neighborhoods, complexes, and subdivisions you want to sell in by having dedicated pages/tabs for each. People will not easily connect with you as the local real estate expert if everything you do is disjointed, making potential real estate buyers and sellers have to work harder to find you. This may be effective in the short-run to market a particular home but in the long-run, you do a disservice to your online marketing efforts and to your future home seller clients who need your "Google juice". Torontoism is a great example of owning the neighborhoods you service while building your notoriety as their real estate expert and enhancing your home sellers' visibility. In essence, you have to be positioned to create a lasting presence. 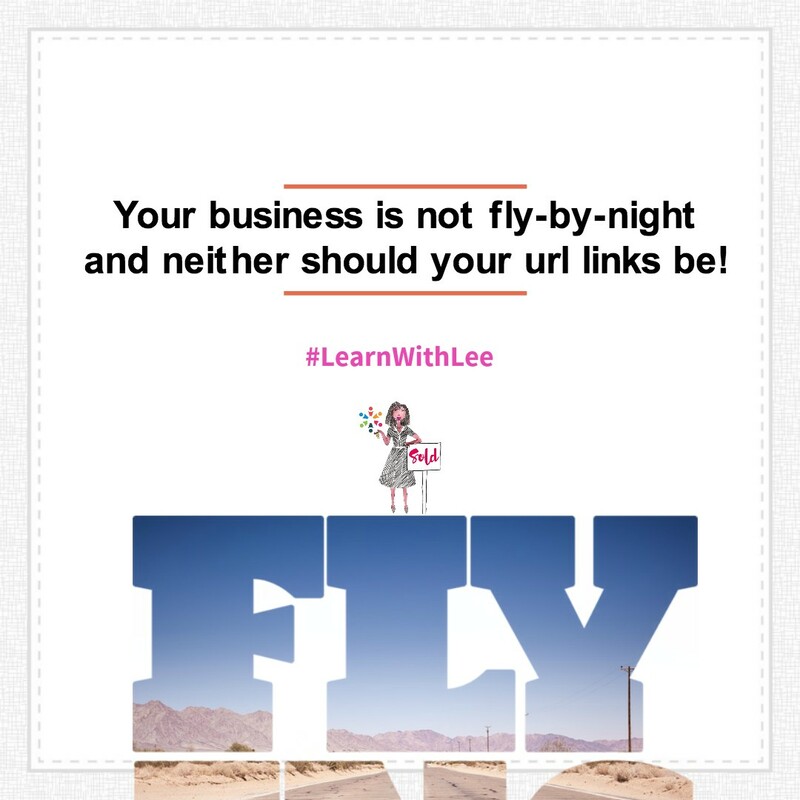 Your business is not fly-by-night and neither should your url links be. This is your online footprint and broken, outdated links, that sabotage your online public esteem and exposure are not allowed! Have some questions of your own? I would love to hear from you! Give me a shout on Facebook, Instagram, YouTube, and Google+ or by visiting LearnWithLee.Realtor. And, be sure to tell the real estate agents you know to get a copy of the 5-star rated workbook, Plan to Win, to transform their real estate sales game plan. Here's to your success!